What better way to keep your loved ones close to you than to carry a portable digital photo key chain? Kodak Smile G150 lets you store up to 100 photos with you wherever you go to show off your favourite people and moments to others. The pictures will be displayed on a brightly lit 1.5in LCD screen. Measuring 1.75 X 2.88 X 0.38in, the digital photo keychain takes up little space even when you are travelling. Built-in software and USB connection make picture transfers a breeze. Automatic slideshow enable the photos to be viewed with ease. Furthermore, the Lithium-ion rechargeable battery can support up 2 hours of viewing time. 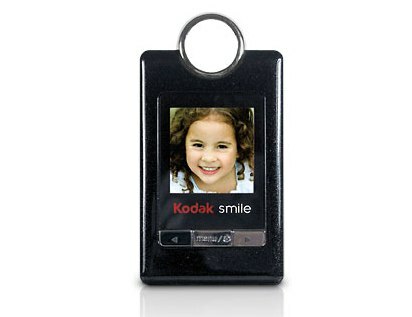 The Kodak Smile Photo Keychain will make a perfect Christmas gift for loved ones travelling to a distant land.